This Red Raider is our art intern, Katie! 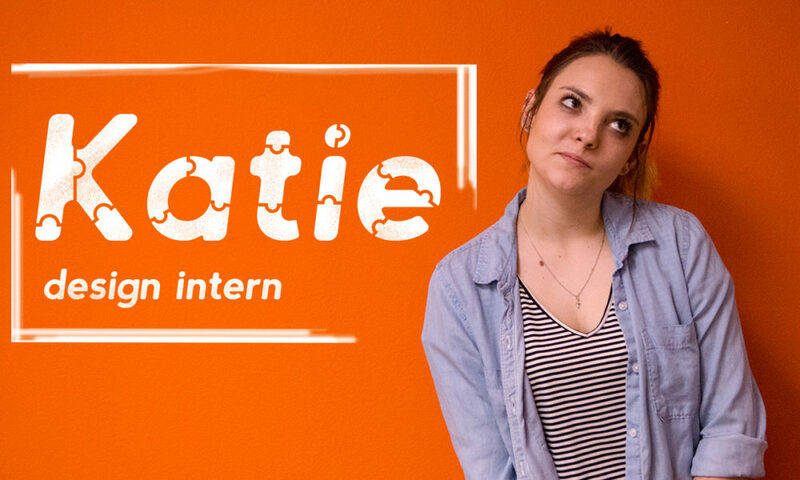 She has a can-do attitude and a fresh perspective on design—making her a valued member of our intern roster. Katie’s determination to apply what she’s learning in the classroom to the variety of tasks we hand her each day is impressive to say the least. This football-crazed girl has a fun, carefree spirit that brings joy to our creative department. Read more to gain some insight on what it’s like to be an art intern here at RD Thomas Advertising! A good friend who is also a graphic designer. I walk in and start asking around about what people might need done. I get odd jobs here and there, but they always have to do with what is going in in the office or the season for clients, so I never know what I’m going to get to work on when I sit down at my desk. My professor recommended me and I got in contact with the office, scheduled an interview, jumped through some hoops at Texas Tech to clear up my schedule, and here I am. In a lot of ways, my daily routine is what I expected, but I had not anticipated the variety of projects that would be going on around me. I enjoy getting to help out and learn from those and my hope is to get more and more involved anywhere I can. I am hoping to develop my basic design skills beyond what I know from a classroom, and I hope to gain exposure to real world experience in design and working with a group of people with more experience and knowledge than me. That’s hard to say because I haven’t been here very long, but I would say that I have learned a lot from the organic work environment. The process behind design isn’t always as simple as certain steps, and I have enjoyed seeing that play out around me. What is the strangest assignment you’ve been given? I don’t know if this counts as an assignment, but when they were doing the Valentine’s Day shoot, I was called in simply to help throw stuffed animal insides across the shot. You never really think about how those things end up in videos until you do it. The most fun assignment I’ve had was when I got to brainstorm with some of the media interns regarding a social media Valentine’s Day campaign. I did not end up working on any of the graphics but it was really interesting to see that side of it and get to pitch visual ideas to go along with them. As for an actual assignment, I was able to work on a newspaper banner ad, which I had never done before, and I enjoyed getting to use given information and form it into something visual. I haven’t had any bad assignments so far, but I have had an assignment go badly. On my first day (of course) I was asked to trim some prints for Addy submissions. I accidentally cut through one of the posters that was underneath the one I intended to cut. The entire document had to be printed again. It worked out fine and wasn’t really a bad assignment, but I guess you could say I left with all the confidence that day. I see graphic design as puzzle solving. I love to take abstract information and ideas and turn them into tangible, visual aids. So a lot of times I read, listen to, research, watch, etc. as much as I can find about an idea until it all kind of scrambles in my head, and then I start sketching to see how the ideas could work together. Honestly, Design I was my favorite, because it was the first time someone had taken ideas and like color theory and design concept and put them into a structure that I could learn. I had always been fascinated by them, but that class was the first time I learned how to put them into words. I have enjoyed applying those concepts in higher level, more specific classes, but I enjoyed the first one the most. Which class has proven to be most beneficial in regards to your internship responsibilities? Typography. A large portion of what I have worked on, as I assume is the case for almost everyone here, involves type placement and its relationship to the rest of the layout. Which advertising/graphic design project are you most proud of? At this job, I haven’t had the opportunity to work on very many, but in my free time, I have gotten to work on some Instagram graphics that I think turned out nicely. Depends on my mood, but I don’t pay for either. Apple music all the way. Using my left hand…because I am left handed. Being joyful in all circumstances. Screenshots of designs I liked. I am a devoted Tennessee Titans fan and have been my entire life. I love watching football, especially the NFL.